I described in an earlier post my algorithm for placing the capital city in each of my countries, expanding on that I wanted to gather some more information about the make up of each country so I can make more informed descisions about further feature creation and placement. One key metric is the population for the country as knowing how many people live in each country is key in deciding not just how many settlements to place but also how big they should be. Until this is known much of the rest of the planetary infrastructure cannot be generated as so much of it is dependent upon the needs of these conurbations and their residents. World population density by country in 2012. A completely naive solution would be to simply choose a random number for each country but this would lead to future decisions that are likely to be completely inappropriate for both the constitution of the country's terrain and it's geographical location. 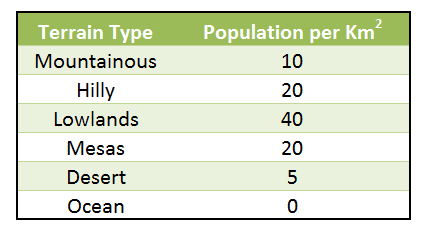 A step up from completely random would be to weight the random number by the country's area so the population was at least proportional to the size of the country but again this ignores key factors such as the terrain within the country - a mountainous or desert country for example is likely to have a lower population density than lush lowlands. To try to account for the constitution of the country's physical terrain rather than just use the area I instead create a number of sample points within the country's border and test each of these against the terrain net. As mentioned in a previous post, intersecting against the triangulated terrain net produces points with weights for up to three types of terrain depending on the terrains present at each corner of the triangle hit. 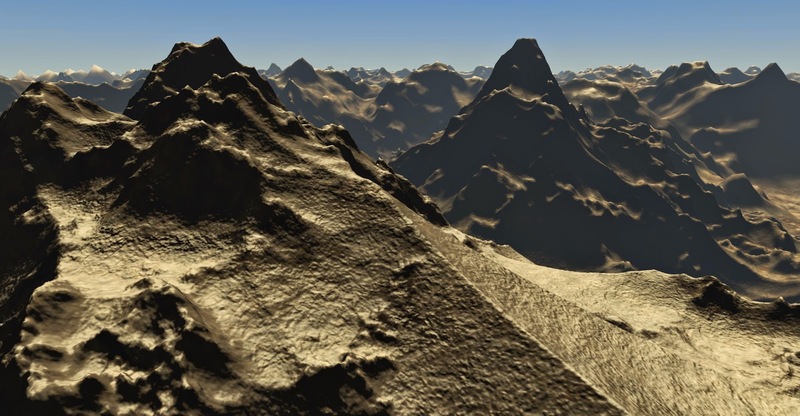 By summing the weights for each terrain type found on each sample point's intersection I end up with a total weight for each type of terrain giving me a picture of the terrain make across the entire country. I can tell for example that a country is 35% desert, 45% mountains and 20% ocean. This is of course just an estimate due to the nature of sampling but the quality of the estimate can easily be controlled by varying the distance between sample points at the expense of increased processing time. Given a set number of samples however the quality of the estimate can be maximised by ensuring the points chosen are as evenly distributed across the country as possible. The number of samples chosen for the country is calculated by dividing it's area by a fixed global area-per-sample value to ensure the sampling is as even across the planet's surface as possible - currently I'm using one sample per 2000 square kilometres. Once the number is known the area of each triangle in the country's triangulation is used to see how many sample points should be placed within that triangle. Any remainder area left over after that many samples worth of area has been subtracted is propagated to the area of the next triangle - this also applies if the triangle is too small to have even a single sample point allocated to it to make sure it's area is still accounted for. If a triangle is big enough to have sample points allocated within it those points are randomly positioned using barycentric co-ordinates in a similar manner to how the capital cities were placed. There is nothing in this strategy to prevent samples from adjacent triangles from falling close to each other but in general I am happy that it produces an acceptably even distribution with a quality/performance trade-off that can easily be controlled by varying the area-per-sample value. 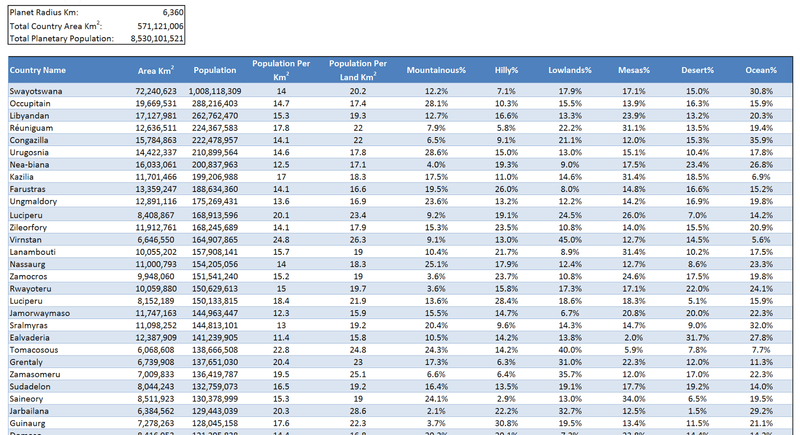 So given the proportion of each type of terrain making up a country how do I turn that into a population value? I assign a number of people per square kilometre to each type of global terrain, multiply that by the area of the country then by the weight for that type of terrain to get the number of people living in that type of terrain in the country then finally sum these values for each terrain type to get the total number of people in the entire country. I've produced these people-per-Km2 values largely by using the real world figures for population density found on Wikipedia as a basis. Using figures a year or two old, the Earth has an approximate average population density of just 14 people per square kilometre when you count the total surface area of the planet but this rises to around 50 people per square kilometre when you count just the land masses. What is interesting is that the sampling strategy ensures that the population count properly reflects the proportion of the planet that is land mass - you can see countries such as Sralmyras which are 32% water have a lower population density by area of just 13 while Kazilia which is 7% water has a density of 17 people per Km2. 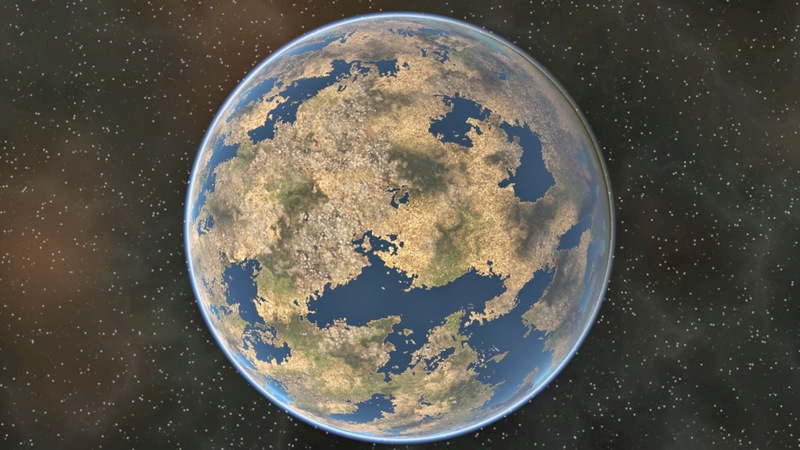 With a population count my plan is to now use that in conjunction with the terrain composition profile to derive a settlement structure for each country so I know how many villages, towns and cities to create. Watch this space.